This burger above has a secret. It is not as fattening as it seems. What did Snack Girl do? Did she add beans or spinach, make it with turkey, or stuff it with bread crumbs? Nope. I took out a shot gun and shot a hole through it. I made a 4 ounce patty - grabbed a shot glass - and punched a small hole in the burger. I made a donut burger! Well, it turns out that a restaurant called 4Food in NYC is selling burgers this way because you can grill it so that the inside and the outside cooks at the same speed. Ground meat needs to be cooked to a temperature of 165 F to be safe for consumption. When you do that with a whole burger, the outside edge can go to 190 F rendering it like leather. I know I have had many fast food burgers that would make great material for my shoes. 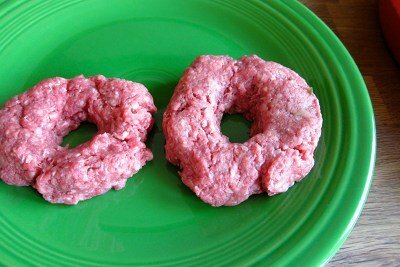 So, they decided to make "donut" shaped burgers and grill them so that they don't compromise the flavor. AND, they make fillings for the inside. Some of them are healthy (salsa) and not so healthy (mac and cheese). For those of you who are trying to cut red meat and calories, this is a great solution. This burger tastes DELICIOUS and it has added vegetables. Based on a suggestion from my pal, Chef Blaine, I decided to make a pickle, tomato, and onion relish to go into the center of my burger. Every bite was burger and yummy fresh relish. I will admit that this takes some getting used to if you eat LARGE burgers. My suggestion is to eat it slowly and really experience the taste of the meat. How do you deal with the summer of burgers? Make 4 round, flat patties of beef with your hands being careful not to handle too much. 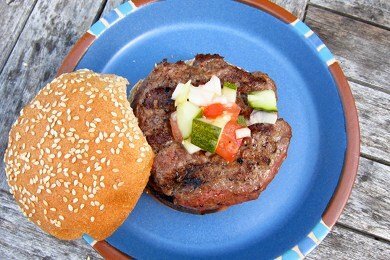 Using a small round cookie cutter or shot glass, cut a hole in the center of the patty and use the meat to make another small burger. Chop onion, pickle, and tomato and taste (add salt if necessary). Place relish in bowl. Heat grill for 10 minutes on high heat. Place burger patties on grill for 2 minutes a side for medium rare or 3 minutes per side for well done. Toast buns on grill for 1-2 minutes each. Serve burgers with relish in center of whole and any other of your favorite condiments. I remember the outcry when a UK pizza chain tried to do the same - cut out the middle section of the pizza - but I think this is a great idea. I'm both losing weight *and* I've distinctly gone off the current fashion for burgers with the centre so rare the cow's tail might as well still be attached! I guess Emeril would say "Bam!". Couldn't resist. Like the idea and will try i this weekend. I wonder what my husband would say if I made these. We already skip the bun. Are there any problems with the burger falling apart when you make them this way? Great idea, though! @Kristen - surprisingly, this worked without falling apart. do not overwork the meat - just make a patty and core out a hole and it stuck together - I was amazed that they didn't fall apart. I guess you could just make thinner burgers. I like them that way anyway. Isn't a serving of meat supposed to be 3 oz? This is a great suggestion. I'll try it the next time I'm grilling out. I like my burgers medium rare but always find that the center fails to cook while I've burned the outside. Like you said, this hole in the middle is great to fill with more food! wow! the cynic in me totally thought you were going to suggest one of the usual tricks (turkey/beans/etc). however, i never heard of this, so i'm pleasantly surprised! i actually don't like the taste of hamburger, but ground turkey burgers always end up dry so this would probably be a great solution! thanks! I like the story of shooting out the middle with a shotgun.....however I thing gunpowder would ruin the tast. I always add shredded zuchini to my burgers making them lower in ww points, also makes them moist. I love this idea! Hamburgers always have more beef than I need, so this seems like it would be just the perfect amount of meat, and perfectly cooked. Wow, thank you for the tip. I don't tend to eat beef burgers (except for in n out burgers a few times a year--yum!) but it's especially important to cook poultry through so I'll be doing this to my turkey burgers. Thanks! It's funny that I was just reading an article in a cooking magazine about the best way to cook a burger in which it was stated to put a thumb print in the middle since the meat tends to bunch up in the middle as it cooks. This post follows that concept with the nice addition of veggies. My burgers have also been around 4 or 5 ounces, but thanks to you guys they'll be much better. Wow, just accidentally came across this page (posted before I received your daily emails) and it is the perfect solution to my problem. I really like the new 3 Pts+ bagel thins and often use them for my mushroom burgers (meat + ground mushrooms for lower points, but still taste like a regular burger!). If I make the burgers with a hole as you suggest, it will reduce the already low points even further and fit well on my bagel thins - which I don't think were available when you posted the picture above on a regular bun. I would seriously consider re-posting this showing the hole-burger on a bagel thin - how cute and clever would that be!! I usually just flatten mine out and make them small, but this is a better idea. Adding onion, garlic and mushrooms to the middle could be really delicious. Thanks for the idea. What kind of ground meat so you use? Thanks! I am making tonight for dinner- also buns? Which ones for this calorie count!? Thanks. @Suzanne - I use 85% ground beef and I found a bun that was 100 calories. Hope that helps!